For those that can remember the pre-1990s football boom, Schools internationals perhaps mean a little more than to those who have lived only in these days of saturation coverage. Prior to the Premier and Champions' Leagues becoming a regular sight on our televisions, one of the few games to be broadcast live on a regular basis was the annual Victory Shield match between England and Scotland's Under-15 sides. Sadly, Northern Ireland's boys could seldom expect such coverage. Schools internationals date back to 1907 when England first played Wales. It was around this time that a championship series, in-line with that played by the Home Nations' senior sides, was first mentioned. One of the earliest stumbling blocks was a lack of official organisation in schools football outside of England, for whilst the English Schools' FA (ESFA) was founded in 1904, the Scottish Schools' FA (SSFA) did not come into being until 1911 and the Welsh Schools' FA (WSFA) until 1912 (for internationals prior to this the ESFA had actually selected Wales' team). Similarly, in Ireland, organised schoolboys football was first noted prior to the First World War, but a recognised governing body did not appear until 1924 when the Belfast Schools' FA was formed. Over the following few years further regional associations were founded across Northern Ireland, culminating in the formation of the Irish Schools' Football Association (now the Northern Ireland Schools' Football Association (NISFA)) in 1931. 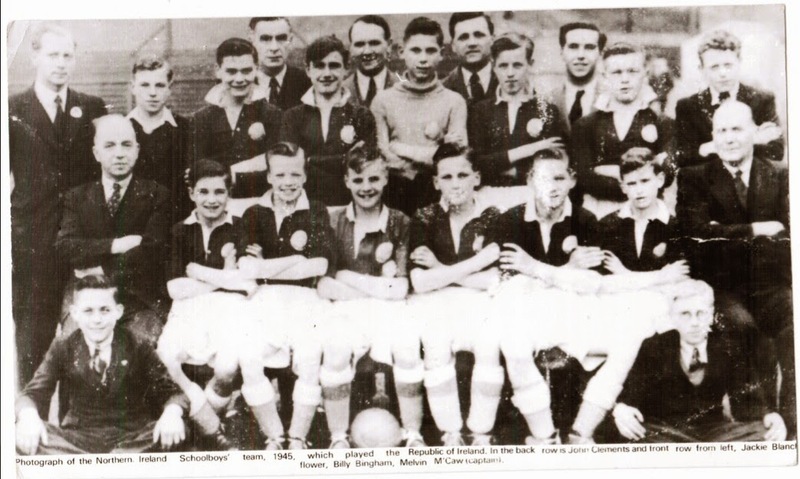 By this stage the Northern Ireland Schoolboys team had already played nine international matches, dating back to 1927, all against Scotland and Wales. It was not until 1935 that the NISFA were permitted to join the Schools' Football International Board (now the Schools' Association Football International Board (SAFIB)) which had been founded in 1914. The reason for the delay was an objection by the ESFA to the governance structure in place at the NISFA, who were largely administered by non-scholastic "gentlemen" rather than teachers. Eventually the NISFA's constitution was amended to the satisfaction of the ESFA and the two nations played their first Schools international in 1934, shortly before the NISFA officially joined the SAFIB. From then until the outbreak of the Second World War the Home Nations all played each other on an annual basis. League tables of results of these matches were often published, but it is unclear what their exact status was and they do not appear to be recognised by the SAFIB as part of the Victory Shield competition, though Scotland were reportedly the first winners of the tournament in 1925. The Victory Shield trophy was presented to the SAFIB to celebrate the end of the Second World War. It was agreed to be played for between the Home Nations Schools' teams, but with a new stumbling block. While the school leaving age in the rest of the UK had been raised to fifteen, in Northern Ireland it had remained at fourteen. As such, although Northern Ireland continued to face the other nations' Under-14s, they were excluded from the Victory Shield which was played at Under-15 level (though the Irish were often included in unofficial published tables). It was not until 1954 that Northern Ireland were officially included in the competition. In 1957 the school leaving age in Northern Ireland was raised to fifteen, bringing parity to the whole competition. The Victory Shield remained largely un-tampered with for 61 years. Played annually in a single match league format between England, Northern Ireland, Scotland and Wales. The trophy has been shared if two or more teams finish level on points. There were only minor changes over the past sixty-plus years; the move from two points for a win to three in the early 1990s and the 2001 switch of the age group levels to Under-16 to fall in-line with UEFA competitions. In 1998, the FA took over responsibility for England's Under-15s and they were therefore no longer a "schoolboy" side. In 2015 England withdrew from the competition in search of more "European and world" opponents and they were replaced by the Republic of Ireland. The NISFA continues to organise Northern Ireland's Under-16 side (as well as the Under-18 side that competes in the Centenary Shield). Although they have always been affiliated to the Irish FA, the links within the set-ups are stronger than ever, in terms of coaching and administration. The most visible manifestation of this cross-over is that the NISFA's teams now wear the same kit as the IFA's (with the addition of a Vauxhall sponsorship logo) having previously sourced their own kits up until the mid-2000s. Further NISFA/IFA integration has continued through the "Club NI" elite player development scheme, which has seen further integration of coaching at youth/schoolboy levels. With the withdrawal of England and introduction of the Republic of Ireland in 2015 the Victory Shield was further revamped. For the first time the competition is to be held over a single week in a pre-selected host country. The tournament was most recently sponsored by Sky Sports. Previous sponsors have included Walkers Crisps, Adidas and Soccer Pal.